Archibald Kay (1860-1935), RSA RSW, Studied at the Glasgow School of Art, where he sketched and painted from nature. He also studied for a time in Paris under Boulanger, Lefebre, and Benjamin Constant. 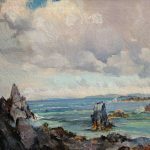 Archibald Kay was a member of the Royal Scottish Water-Colour Society, and in 1905 he was elected President of the Glasgow Art Club.